Fast Crew Supplier (FCS) 5009 Security vessel is the first vessel to be built in South Africa. The FCS 5009 Security vessel is based on Damen’s Axe-Bow concept. The hull and superstructure of the FCS 5009 ship are made of steel and aluminium respectively. Image courtesy of Damen Shipyards Group. 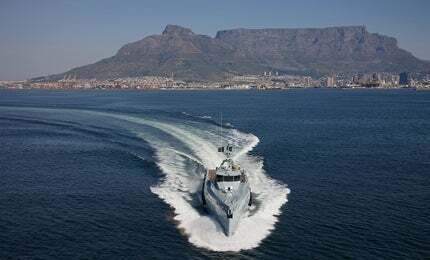 Built by Damen Shipyards Cape Town (DSCT), Fast Crew Supplier (FCS) 5009 Security is a versatile patrol vessel designed for patrolling in exclusive economic zones (EEZs). DSCT completed the construction of two FCS 5009 patrol vessels in January 2015. The vessels are first of their kind to be built in South Africa for use within Africa. A similar vessel of FCS 5009 series is already in service with the Cape Verdean Coast Guard. The patrol vessel can be used as a crew boat and fast supplier, and can perform maritime safety, security of economical waters and coastal boundaries, and search and rescue missions. The FCS 5009 vessel incorporates Sea Axe hull design. The hull is made of steel and the superstructure is constructed of aluminium. The patrol boat has an overall length of 51.25m, beam of 10.1m, side depth of 4.7m and maximum draught of 3.45m. "The vessels are first of their kind to be built in South Africa for use within Africa." The Damen-patented Axe Bow concept provides superior sea-keeping performance, highest operability and fuel efficiency. The design enables the ship to maintain high speeds in strong winds and heavy seas. The concept delivers superior motion behaviour, high fuel-efficiency by cutting down 20% fuel usage, lower resistance and reduced emissions. The vessel is fitted with Sea Rogue weapon system supplied by Reutech Group, a company based in South Africa. The remotely-controlled weapon system incorporates a 20mm cannon on bow deck and two 12.7mm browning guns, fixed at the port and starboard of the wheelhouse respectively. The weaponry, which can be operated by a hand controller, ensures accurate target-tracking. The cargo deck of the vessel covers an area of 225m² and offers cargo carrying capacity of 250t. It is installed with a range of machinery including one 184kg high holding power (HHP) anchor, two Damen interceptor 1102 daughter crafts with two inboard diesel engines, a single point A-frame davit, and two 1,200m³/hr fire fighting (FiFi) monitors. BAE Systems is building a new class of three 90m OPV to meet multiple mission requirements of the UK Royal Navy. Life saving equipment includes six life buoys, 30 life jackets and two liferafts with a capacity to carry 25 people each. The vessel is also fitted with storage tanks with a capacity to hold 165m³ of fuel oil and 198m³ of freshwater. The navigation and communication equipment fitted aboard the FCS 5009 Security vessel include magnetic compass, gyro compass, auto pilot, differential global positioning system (DGPS), electronic chart system, two radars, echo sounder, speedlog, searchlights and GMDSS A3 communication system. Crew cabins, pantry and mess room are located below the main deck whereas additional crew cabins and a sickbay are available in the main deck. The aft deck houses a specially designed unit for offering extra accommodation for occupants. The wheelhouse and accommodation areas are fully air-conditioned. FCS 5009 Security is the first vessel in its class to be equipped with MTU engines, which deliver lighter weight-to-power ratio for enhanced speed. The four engines generate a total power output from 4,000bkW to 8,000bkW. The propulsion system also incorporates four Reintjes/ZF gearboxes, four fixed pitch propellers and two 75bkW bow thrusters. The patrol boat can sail at a maximum speed of 26kt. The shipboard power is provided by three Caterpillar C4.4 generator sets complemented by an electrical network of 240V/415V. Auxiliary equipment aboard the vessel include engine room ventilation with airflow of 72,000m³/h, bilge pumps with a capacity of 25m³/h, bilge water separator, dynamic fuel separator, sewage treatment plant, and cargo pumps.